Good Day! 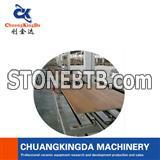 I would like to request quotation for Stone Countertop. Thank you. We are interested with your products, since we are on granite & marble, supply & installation business. how much is the price of this item? I am very interested in the 'suplier hot popular best prices Glazing line Body Glaze Line Tiles make auxiliay equipment' you released on STONEBTB.com. Good day, I would like to ask for a cost quotation about the tile glazing line. Thank you. I needed samples of the following product of yours: 1. Aluminum Composite Panels 2. Artificial Stone Thank you very much.